TORONTO -- High school students across Ontario walked out of class Thursday afternoon to protest the provincial government's recently announced changes to education. The Progressive Conservatives have come under fire for recent announcements impacting several facets of the province's education system. Announced plans include increasing class sizes, making students take more online courses and overhauling the autism program to introduce funding caps on services many parents see as essential. One student who helped organize Thursday's walkout said the government's moves have sparked a "wildfire" of political activism among the province's youth. "I think they're angry, they're hurt, and they're ready to rise up," Frank Hong, a Grade 12 student at Toronto's Marc Garneau Collegiate Institute, said of his peers. "We're all students. We did not spend any significant amount of money on this," he said. "It just caught on like wildfire, and it went across the province." School boards and teachers unions have warned that the government's planned increase in class sizes will result in thousands of teaching positions being lost over the next four years. Some boards have also written to the education minister saying the move will mean they can offer fewer elective courses, such as in the arts and skilled trades. 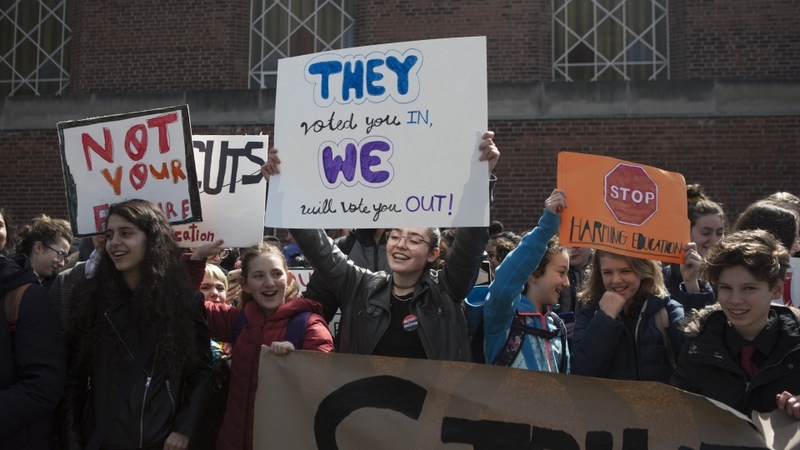 For some students taking part in Thursday's walkouts, class sizes were top of mind. "In some of our schools class sizes are already too large," said Maira Nisar, a student at Toronto's Bloor Collegiate Institute. "This will make it worse." 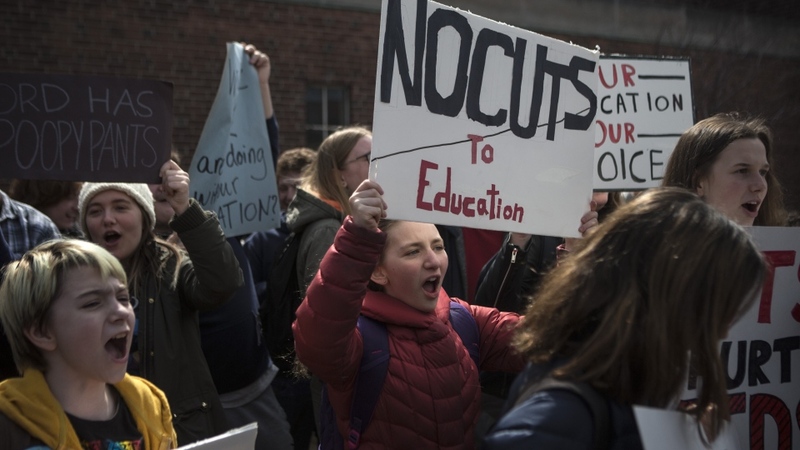 Nisar was among students who held a raucous demonstration with banners, signs and chants saying "Doug Ford must go" and "no cuts to education." Grade 10 student Megan Garzon said students recognize the government's desire to implement a cost-cutting agenda, but said education should not be a primary target. "We know there is a deficit but that doesn't mean education should be the first thing you cut," she said. Education Minister Lisa Thompson has said there will be no "involuntary job losses" as a result of the plan and that Ontario high schools currently have one of the lowest student-to-teacher ratios in the country. She characterized Thursday's walkouts as "political stunts" and criticized unions for not discouraging them. "On a day when we reached out to begin good-faith consultations with Ontario's teachers, we instead are seeing Ontario teachers' unions condoning a student walkout at schools across the province," Thompson said in a statement. Premier Doug Ford accused "union bosses" Thursday of telling both teachers and students what to do when it came to the walkouts. Teachers have a responsibility to parents to keep students in the classroom, he added. "We know that the Grade 6 students, 50 per cent of them are failing math," he said. "Maybe they should keep them in the classroom to teach them more math." "The students didn't need, want or ask for our help," he said. "We didn't offer or provide any help whatsoever. The premier and the minister should be embarrassed about making another fact-free claim." NDP education critic Marit Stiles said the government's union comments were insulting to the students who walked out of class, adding that they were forced to make the move because the government isn't listening to them. "Nobody wants to have to protest for very basic things like public education," she said. "But, unfortunately, what we've found with this government is that they don't seem to listen to reason ... I hope they get the message loud and clear and back away from this decision."